The fundamental attribute of nearly all the major health care sectors is the relentless pursuit of profit without consideration of the larger social consequences. Some may call that "amoral greed," but the reader can apply his/her own terms. Add to this reality the fact that some health care competitors also act in a manner that is clueless, while others exhibit varying levels of laziness, arrogance and spinelessness. Consider the payer segment of health care. These are mainly the public and private insurers and the self-funded employers that provide coverage for most Americans. An unstated but implicit message of several postings here is that unless pharma gets its strategic orientation in order and brings its public-be-damned pursuit of profit under control, the payers will give them a thrashing. That would seem to follow because the premise behind both Obamacare, as well as the private health care market, consists of giving payers de facto charge over system. The Affordable Care Act/Obamacare does it by requiring everyone to get health insurance. The thinking there was that this would oblige payers to justify their place in the system by controlling costs and improving quality as a result of constraining providers and manufacturers. Any lingering notion that an insurance/payer-driven approach could work in the U.S. now seems increasingly improbable because most private insurers decline to take the initiatives required of them if they are to push American health care toward an affordable, effective system. An example of that comes from sources at several large health insurers, including some Blue Cross/Blue Shield companies. They make the point that their managements either remain indifferent to pharma pricing or mistakenly see it as benign. Rather than actively managing their populations, their participating providers and the health care manufacturers, the insurers prefer to operate in the old, insurance sales mode of passively making money on the float while allowing costs to escalate. By and large, they feel their recourse lies in passing higher costs along to policy holders in the form of premium increases. 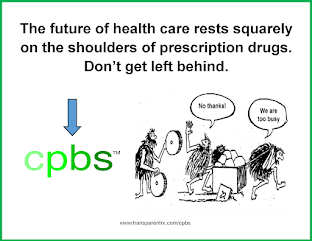 A source at one BC/BS said his colleagues rarely even give any thought to pharma because they outsource that concern to their Pharmacy Benefits Management (PBM) company. Another health insurance manager related the astounding fact that his company's director of strategic planning actually considers pharma as a constructive force for controlling health care costs. This strategic planner told the people reporting to him that their company's absolute amount of “medical loss” over the past couple of years has remained fairly level. At the same time, the relationship among the factors contributing to those medical loss expenses has changed, so that hospital expenses have declined as a percentage of the total, while pharma costs have risen substantially. Demonstrating an incredible piece of fallacious, post hoc reasoning, the planning director then concluded that spending more on pharma decreases the larger amounts paid to hospitals. For that reason, he sees rising pharma expenditures as a good thing! Even those private payers not challenged by basic logic shrug and say, "We can't do anything until CMS [the Center for Medicare and Medicaid Services] acts because we need their blessing to make any tough decision stick." Since CMS is highly susceptible to political lobbying exerted through Congressional pressures, the payers' decision to defer bold action is a recipe for rising costs and other deteriorating results. Once again, several health care trends are headed in the wrong direction. Last week, for example, the Wall Street Journal's economic outlook for 2015 predicted (actually, "retrodicted," since it's already happening) substantial price increases for new and old branded drugs, as well as generics. In an effort to project where this will lead, Kim Slocum, a health care analyst in West Chester, said, "Pharma fundamentally faces two choices. Either the industry must find a way to play in the whole 'value-based health care movement,' with risk-bearing pricing contracts, or it will face a really ugly environment marked by cost-shifting to consumers that ultimately leads to price controls." Slocum's "ugly" scenario for pharma would spin out the following way. As employers and insurers ratchet up their cost-sharing approach to coverage, pharma companies will have to ease the burden of higher co-payments, deductibles, and co-insurance on patients who take branded drugs. The pharmas will need to do that by hugely increasing the subsidies to employees and members contained in the "coupon" or "co-pay card" programs they run now. If pharmas fail to do that, the policy studies show that patients' will respond to cost shifting by avoiding care and not filling prescriptions. The extent of such avoidance will cause an enormous drop in drug company sales. 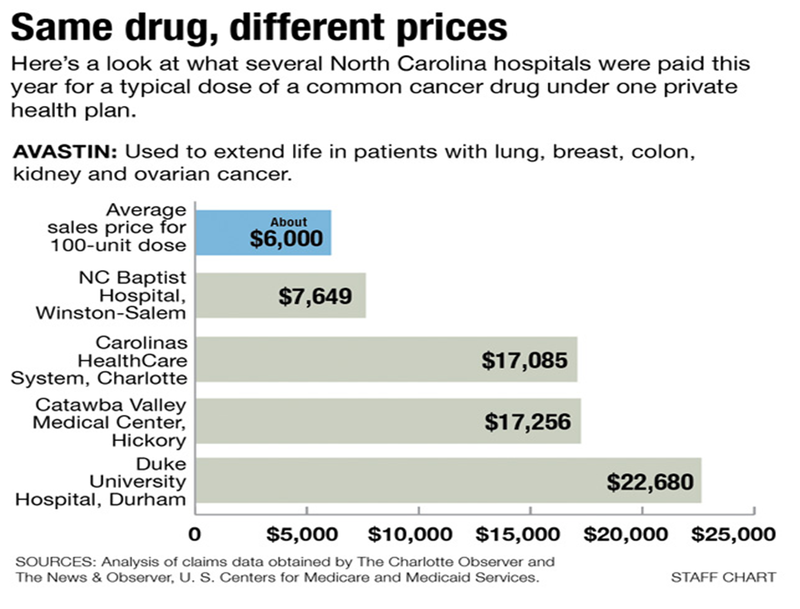 But Slocum claims he ran projections showing that in an era where patients face $10,000 in out-of-pocket costs before their prescription insurance kicks in, the cost to pharmas of running these co-pay programs will seriously erode their profit margins. "This will be the ultimate rebuke to pharma CFOs," according to Slocum. "They'll either have to watch demand drop like a rock or give up profits." He believes that constantly rising drug costs, unrelieved by cost-shifting coverage, will eventually lead to political demands for some form of price controls. Since pharma managers find that anathema, they are reluctantly making feeble efforts to see how they can work in a pay-for-value system. Providers represent another health care sector characterized by antisocial greed. Unfortunately or fortunately, depending upon where one stands, they have been substantially smarter and bolder in their pursuit of profit. Their fundamental effort consists of undermining the implicit public and private trend to make payers herd the providers and manufacturers. For several years they resisted payers as hospital-based, integrated delivery networks bought up medical practices and other provider services, thereby exerting leverage over the insurers on pricing and usage volume. The latest approach of large provider networks, exemplified by the University of Pittsburgh Medical Center (UPMC), consists of turning themselves into provider-payer systems that sell coverage as well as medical care. They claim that with this approach, their hospitals, clinics, physicians and other medical services would have no incentive to charge their own insurance arm steep prices. Actually the idea is approximately 75 years old as Kaiser Permanente began using it during World War II. That point suggests one of the problems with the payer-provider approach. At one time Kaiser was a low cost source of coverage and care on the west coast. Today, costs to consumers at Kaiser are closer to what they have to pay elsewhere, according to Mark Smith, head of the California HealthCare Foundation. Some of that results from the practice of "shadow pricing" in which producers in a market lacking transparency price up to a level just slightly below that of their competitors. As a result some of Kaiser's larger customers report annual premium increases of 20% in recent years. The other problem is that the idea of the insurance arm and the provider arm both working to control prices is also illusory. Insurance margins are very small. 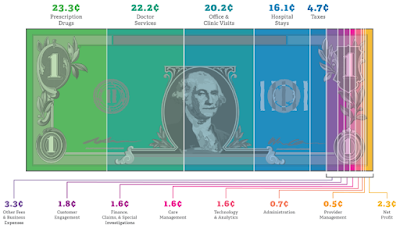 As financial service companies, insurers make their money by aggregating capital and investing it. Providers, on the other hand, generate huge revenues that they disperse unevenly in the form of high compensations to their top executives and high-volume practitioners. One need only scan the skyline of cities such as Pittsburgh that recovered from de-industrialization partly by developing medical care facilities. The enormous buildings erected by these integrated networks proclaim their wealth and influence. In a very real sense, they are the contemporary counterparts to gothic cathedrals of the 13th century. So if a parent company owns a low margin and a high margin business, its not hard to guess which one the parent will protect and feed. More costly procedures and over-treatment will remain the standard in U.S. health care. In 1980, Arnold Relman, then the editor of the prestigious New England Journal of Medicine and previously a professor of medicine at Penn, described a "medical-industrial complex" in the U.S. He wrote that the system "creates the problems of overuse...fragmentation of services, overemphasis on technology and 'cream-skimming." Dr. Relman passed away last summer at age 91 and it is worth noting that at the end of his life, both he and his wife, Dr. Marcia Angell, wrote that the situation has grown far worse during the ensuing 30-plus years. Profit-seeking insurers and provider networks, according to Relman and Angell, will never permit the U.S. to develop a health care system that meets the goals of universal coverage, controlled cost and uniformly top-tier quality. The problem lies not just with the system, but also in the conduct and capabilities of its separate sectors. Pharma is just one part of the package that falls short of bringing Americans the health care we deserve.